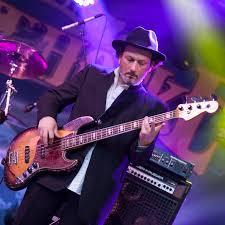 About two years ago, I was on one of many music-and-booze-filled vacations in New Orleans, this time with my friend and Voodoo Blues-brother Anthony Galasso, a great guy and even better bassist. It was Saint Patty's Day weekend, and after a parade filled with pubs-on-wheels, cabbage-tossing, shamrocks painted on my bald head, and many afternoon drinks at Molly's, we headed down Decatur towards Frenchman street, stumbling into the Balcony Music Club, drawn by the sound of some great hard-hitting blues... Johnny Mastro and Mama's Boys, to be exact. Immediately recognizing the guitarist, Smokehouse Brown, as someone i'd seen on past visits to the Big Easy (tough to mistake the signature look of a fedora, shades, long beard, and ES-335)... I recalled a very inebriated night on Bourbon Street during a previous visit, standing in one of the many tourist trap cover band joints, seeing a guy with the same beard, sunglasses, and Gibson semi-hollowbody absolutely SLAYING a Duane Allman solo on slide guitar (Fuzzy deja vu is the best kind, right?)... had to be the same dude. Ant & I ordered a round of Abitas and hung out...these guys were absolutely crushing it at BMC, from the harmonica-howling lead vocalist, to an incredibly solid bassist with a beautiful '65-style block-inlay sunburst Jazz Bass laying the foundation over pounding drums, and Smokehouse switching back and forth from slide to standard, doin' his thang thru a Silvertone combo. This was the kind of music Ant & I both loved, a blend of traditional Delta blues mixed with fuzzed-out garage rock guitar, lo-fi vocals thru a Green Bullet, intense yet delicate at the same time, inspiring enough for us to start our own group upon returning home. After the set, we met the guys, and learned they got their name from their singer, Johnny Mastro, originally from Geneva, NY, who started the group in Los Angeles almost 20 years ago, with CA native Smokehouse joining soon thereafter; but who was "Mama"? 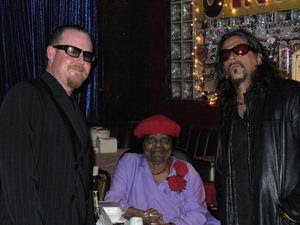 That would be Laura Mae "Mama" Gross, longtime proprietor of Babe's and Ricky's Inn, a south-central Los Angeles blues institution for over four decades, graced by such names as B.B. King, Bobby Bland, T-Bone Walker, Albert King, Albert Collins, Eric Clapton, Keb Mo', and many more. Mama would encourage beginners to join the open jam on Monday nights; if you showed promise, maybe you'd get a Thursday night slot. From there, after much practice and "goin' to school" under Mama's tutelage, you might be able to join the house band on Fridays or Saturdays, and truly become one of "Mama's Boys". There's an excellent documentary on Mama and her Inn that I suggest any blues fan check out. Johnny and Smokehouse gigged incessantly in the Los Angeles area, recording several albums including Beautiful Chaos (my favorite) before relocating to New Orleans in 2013, where the thriving live music scene provided even more opportunity for gigs and growth. With the internationally-known rhythm section of bassist Dean Zucchero and drummer Christophe Gaillot joining the Mama's Boys in NOLA, they've embarked on several European tours and released a great new album, Never Trust The Living, earlier this year. They can be found at the Balcony Music Club, as well as Bamboula's and the Apple Barrel, both on Frenchman Street, regularly. This is the NEW New Orleans blues sound.